The word journey has a simple dictionary definition: it’s an act or instance of traveling from one place to another. The connotations associated with the word, however, rest far deeper in our collective consciousness. The word can imply the growth of very specific ideas and understanding within a set time frame; or perhaps a long and hard-earned internal challenge, met through overcoming emotional obstacles and hurdles. We use the word to imply a change. It’s more than simply moving from one place to another, it’s morphing throughout that move into a different place—be it mental or physical. Two years ago I met Lee, an affable coffee shop owner living in Chiang Mai, Thailand but originally from a small hill-tribe village about four hours away. Lee is on a long journey, but the distance traveled is not far. Instead, Lee lives in Chiang Mai running Akha Ama Coffee, a fair trade coffee shop in the city. It wasn’t until I met Lee, and went on a Coffee Journey with him, that I came to a deeper understanding of what it means when something is sustainably produced with a mind toward fair prices paid to the people producing the coffee, ie., fair trade. 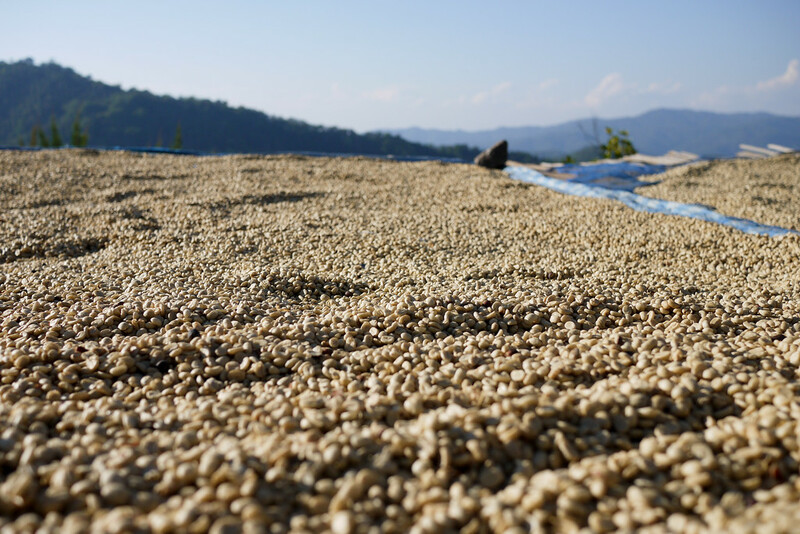 Lee’s mother spread the recently husked, wet coffee beans in the sunlight so the beans are thoroughly dry before villagers bag them and truck the beans to Chiang Mai for roasting. It’s trendy now to bat around these words; when we look at words like “organic” and “sustainable” on our foods, clothes and consumables we feel good about supporting something positive out there in the world. That’s the assumption. And I too use these words in my writing and my volunteering, I emphasize the need for each traveler to begin understanding how intrinsically linked we are on this planet. During my travels I looked for ways to support social enterprises, or rather for-profit business operating with an underlying social mission. Businesses like Akha Ama. And in finding Lee’s I learned to look at what these catch phrases mean. Fair trade—that word, it means something very real in practice when we are talking about the people affected by this “fairness.” And, through my friendship with Lee over the past two years, I began to look more closely at how we in the West perceive the impact of our actions by picking up something as innocuously labeled as sustainable and fair trade. What does that mean? 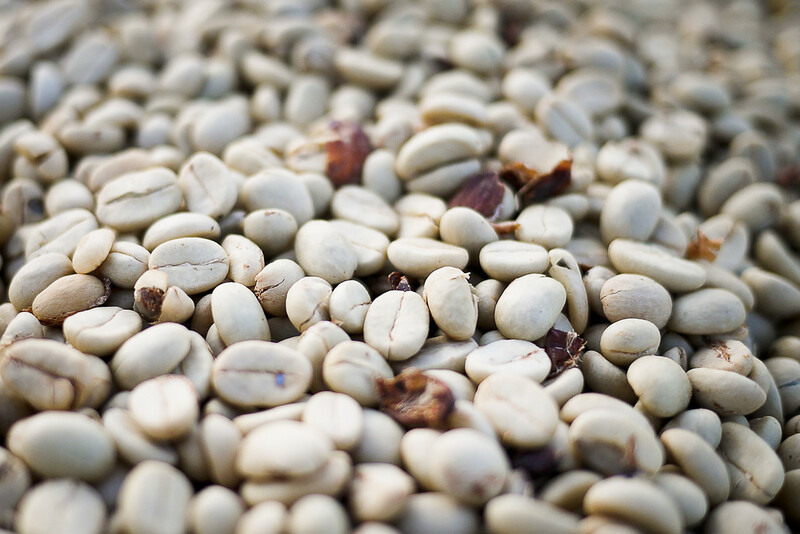 From organically grown coffee plants to a hand-brewed cup of coffee, Akha Ama Coffee takes the beans on a sustainable journey the entire way. 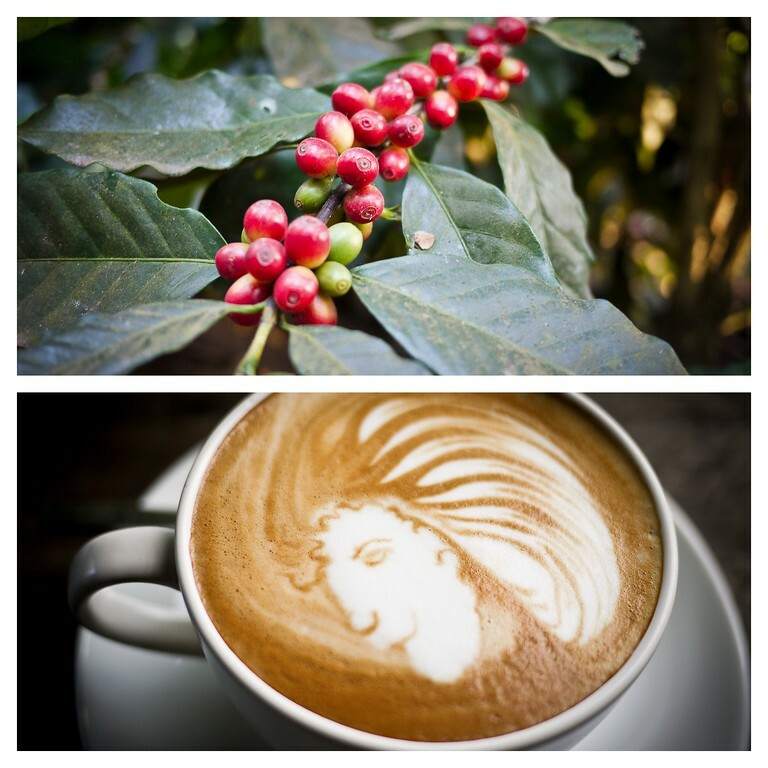 The image on the coffee is the Akha Ama logo replicated in coffee art! In 2011, I moved to Chiang Mai, Thailand for the first time and I lived in the city as what can most closely be described as a nomadic expat—I lived there, but for just five months. 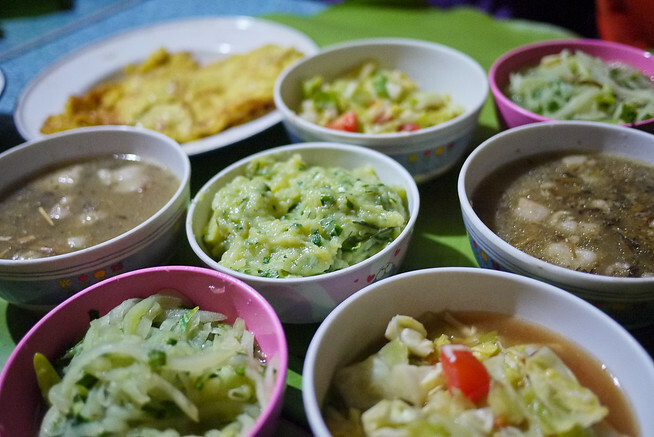 When I landed in Chiang Mai, I knew other travelers and expats living in the city, but I knew few locals. One of my first tasks when I am settling into a new place is to find a decent coffee shop—one with good coffee, fast wi-fi, and a friendly atmosphere. 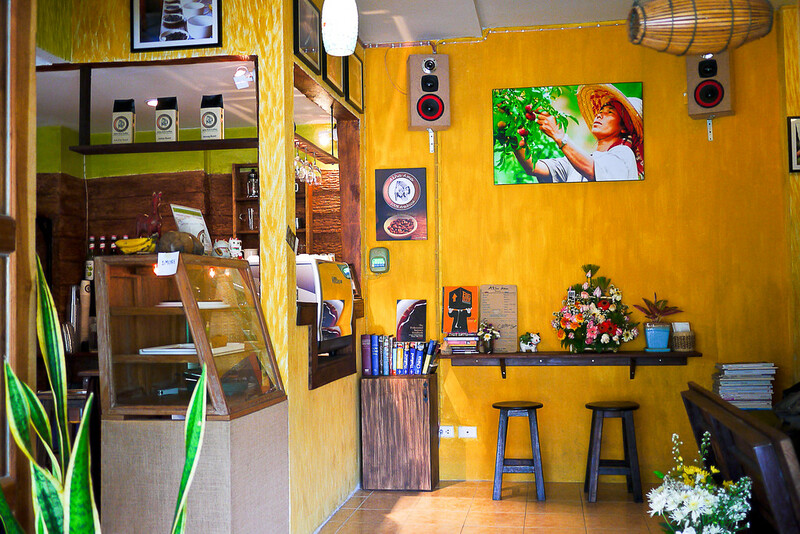 The Akha Ama Coffee Shop in Chiang Mai, Thailand. That’s where Lee’s Akha Ama Coffee shop comes into the picture. Through the local expat community, I met Lee and became fast friends—he is young, too charming for his own good, and quite a character. It’s his story though, the quiet back story that underpins his actions, that makes Lee’s journey stand out. Lee explained more about how they grow the high quality Arabica coffee beans and how the crop-rotation allows them to increase the crop yields without using pesticides. 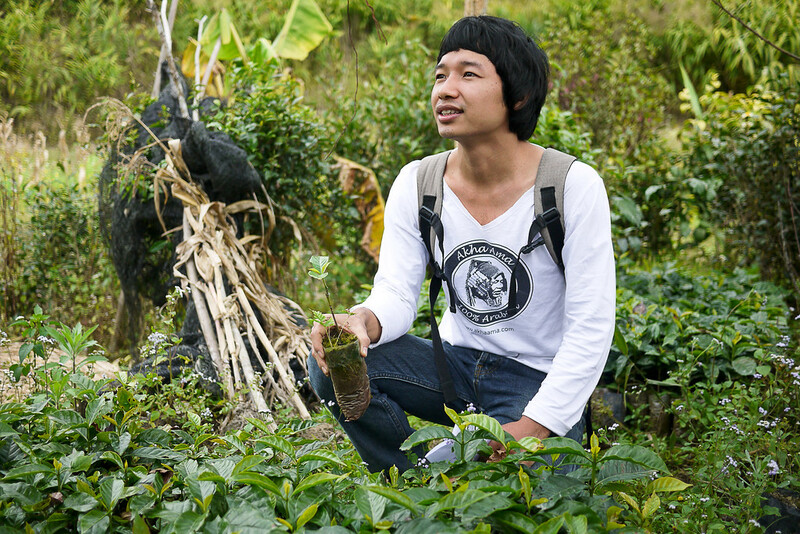 Lee acts as the face of Akha Ama Coffee, and runs a trip twice a year that takes a dozen people to his family’s remote village, where they grow the coffee Lee sells and markets at his shop. 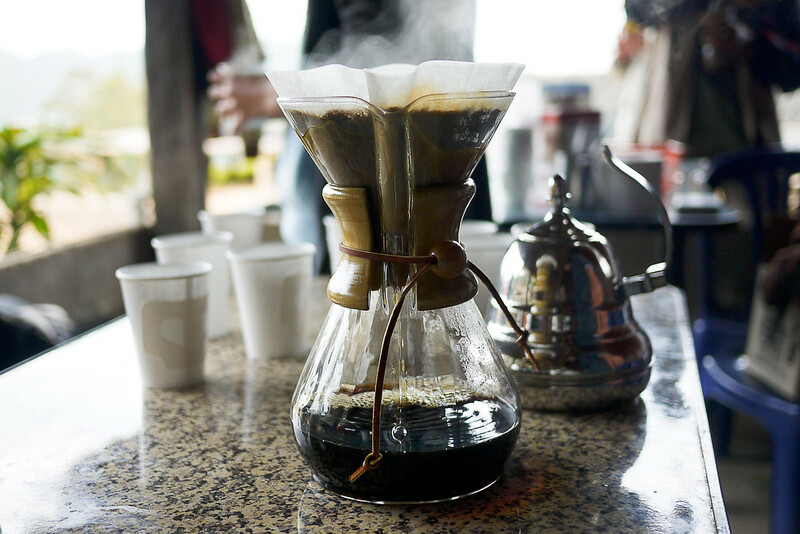 Lee calls these trips a “coffee journey,” because the aim is so much more than seeing how coffee is made—that can be covered rather quickly (I learned the basics of producing coffee in a quick two-hour trip through the Finca Filidefia plantation in Guatemala). But Lee’s trip is instead a three-day journey toward understanding just what goes into a cup of sustainably grown coffee. It’s about the journey his village is taking toward operating as a sustainable, fair trade farming cooperative, and the human story and struggles that underpin each cup of coffee. 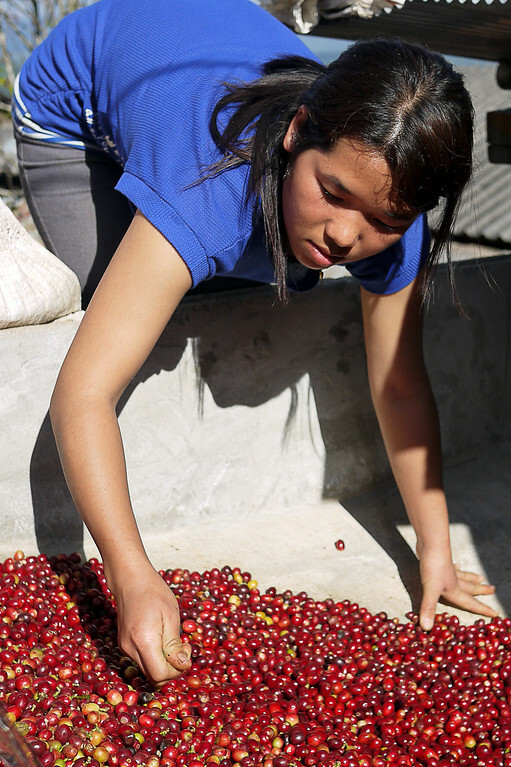 I took my first coffee journey with Lee when I first lived in Chiang Mai for those five months. Then, loving the experience and now calling Lee a friend, my niece Ana and I took the journey together over the New Year’s weekend to welcome in 2012. Lee’s story is powerful, but in the months leading up to visiting Lee’s village, Ana simply knew Lee as a friend. We had talked about his coffee shop, and Ana knew that Lee sold the coffee, but that he was merely the front-end funnel for a community coffee production collective. 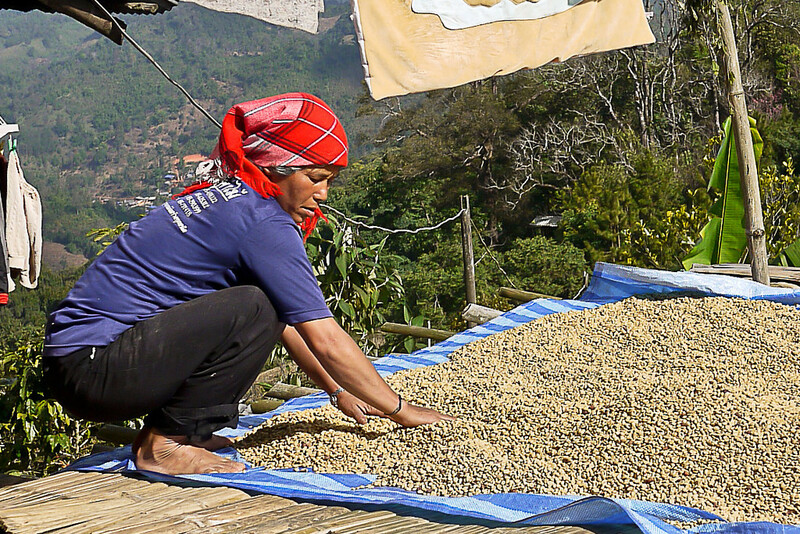 Akha Ama Coffee represents 14 families from the Maejantai village area that have joined together under one brand to increase their ability to control, market, and command fair prices for the coffee they grow. They formed the collective so each family could bring in more money and thus assure themselves education for their children, modern conveniences, and fair wages. Twilight spreads a pink hue and cool evening air over Maejantai village, high in the mountains. The coffee journey to Maejantai village is not a cushy, high-end tour, that’s not the point and not something Lee plans to run. Instead, the participants sleep in homes graciously offered by one of the 14 families, and they eat family style meals filled with hand-picked plants and vegetables grown on the surrounding farms. For Ana, I knew this coffee journey would be unlike anything else I could show her, and I hoped her existing friendship with Lee would give her a unique window through which she could look at the path and choices people make to change their lives when they are given far different circumstances than the ones Ana knew from American suburbia. 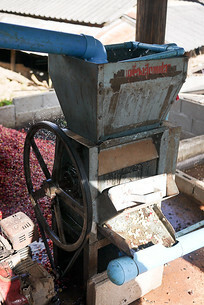 Our Coffee Journey begins in Chiang Mai in the early morning hours of a Friday during coffee harvesting season. Participants arrived at the coffee shop with enough gear for a weekend, and we filed into the back of the yellow songthaews, covered pickup trucks. We squeezed into the truck-bed, our thighs squished tight and each person’s shoulders acting as an effective wedging mechanism for the bumpy ride outside of town and eventually into the mountains surrounding Chiang Rai. 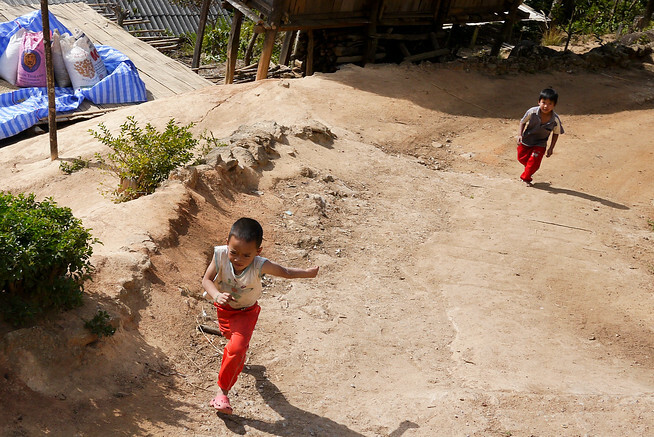 As we made the last quarter-mile of jolting progress up the mountain, hours after leaving Chiang Mai, children from Lee’s village began chasing after our truck. Ana’s young face among the coffee journey participants fascinated the young children, and huge smiles and energetic waving were our first welcome to Maejantai. Excited kids run behind the truck when we arrive at the Akha Ama coffee village. As I shook the pervasive red dust from my hair, face, teeth and eyes, I trooped upstairs with Ana for the introductions to Lee’s mother, for whom the named the business. Lee’s mother reserved a special hug for me, I was one of the few participants making a repeat journey, and it touched me that she remembered from the previous year. Lee is a member of the Akha people, and in the Akha language, Ama means mother. Lee’s mother is sweet and welcoming and oversaw preparing tea for the group as Lee launched into his back story and how Akha Ama came into existence. 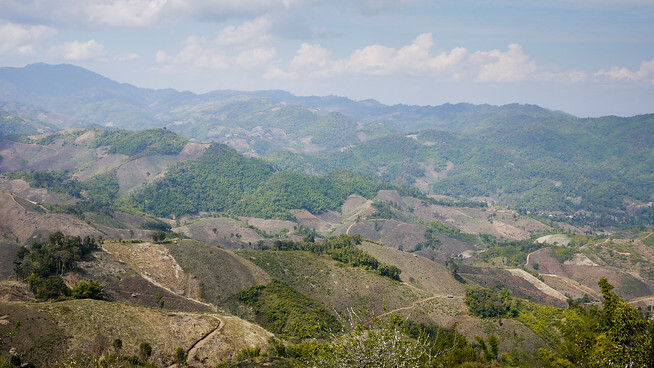 As a result of civil wars and demarcation disagreements over the past several hundreds years, the Akha people live in hill-tribe communities throughout China and neighboring areas, namely Laos, Thailand, and Burma. 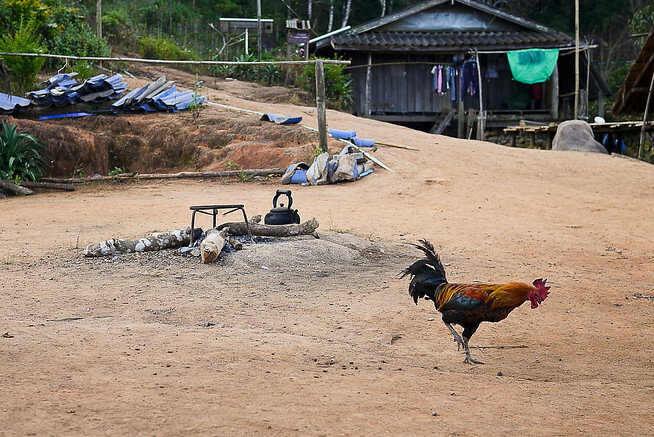 All these groups, though spread out across a wide region, speak Akha … a fact that has largely separated these hill-tribes from rapid westernization since they are often in remote regions and they do not share a common language with their own country. 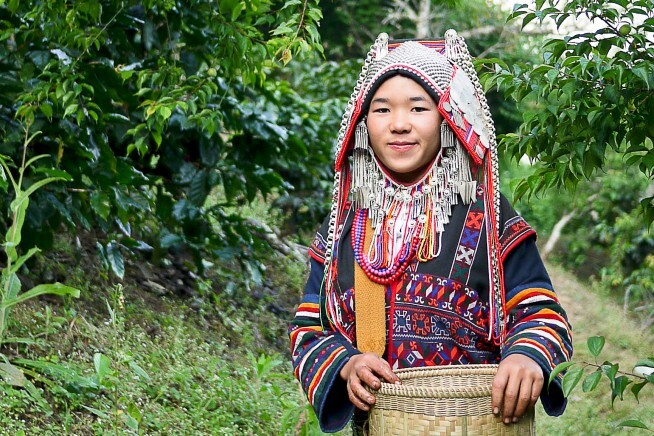 Lee’s sister displayed the traditional Akha clothing in the coffee fields nearby. When Lee was growing up, his mother pushed for him to leave his village and gain a formal education in nearby Chiang Rai. He was the first and only villager to leave and obtain a higher education. Lee studied Thai, learned English from the passing tourists, and began plotting a way to help the Akha farmers and villages in his region when he learned more about the value in community sourced projects. Lee’s mother supported his idea and was a strong catalyst in bringing together the 14 families that make up the Akha Ama collective. In addition to the strength in numbers, the 14 families are jointly working toward sustainable agriculture and new methods of crop-rotation to ensure they are producing organic, sustainable crops that complement and enhance the coffee crops, all without using expensive, harmful pesticides. This is a long process that will take years, and the farmers are working together to transition their crops into sustainable and eco-friendly products. This is the foundation on which the families formed Akha Ama , and out of necessity, it is a gross simplification of Lee’s story. The sacred entrance to the Lee’s village, a village-wide ritual is held annually to replace the adornments protecting the village and its inhabitants from negative spirits. 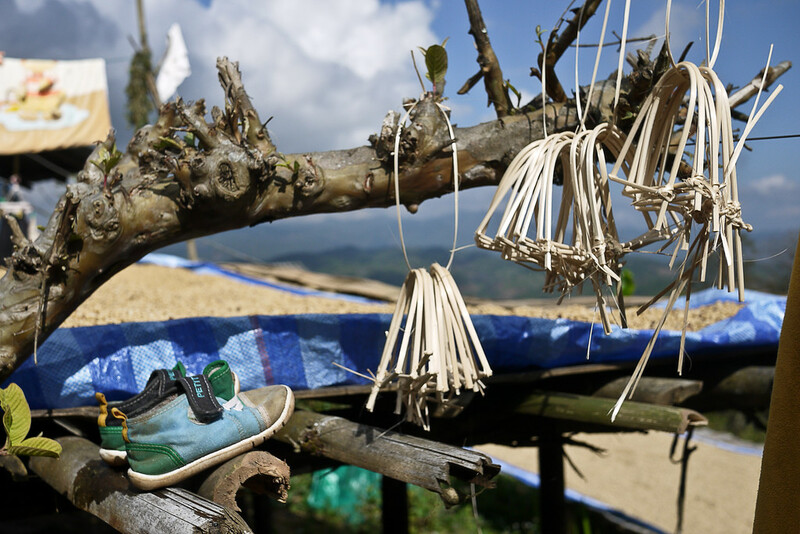 Before the farmers in Maejantai village formed Akha Ama Coffee, they had only one avenue to make money from their coffee—sell the coffee beans at the going rate to whoever would take them. 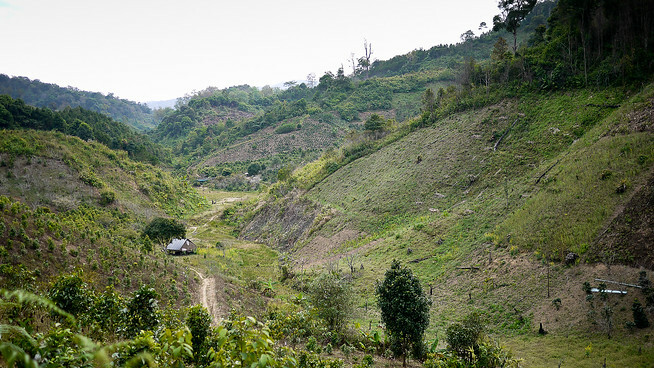 But with his unique link between that village and the mainstream Thai culture, Lee and his family saw an opportunity to take the beans completely through the process—from growing the beans to selling them, so that the farmers could see more monetary returns on their time and effort. 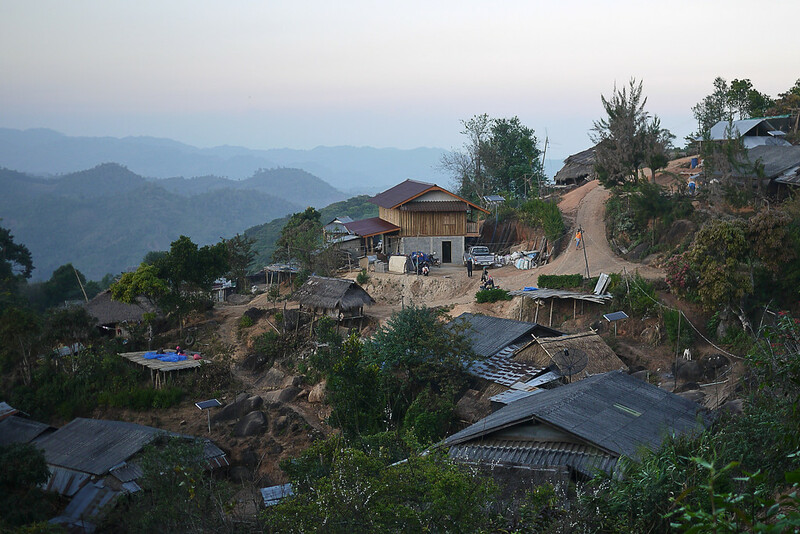 Political issues and cultural differences have meant disparate opportunities available for hill-tribe communities over the years, but Akha Ama aims to fill that gap. 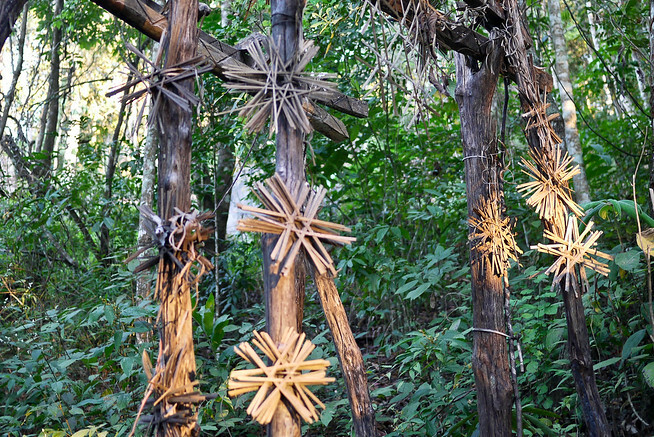 Lee’s village is remote, but the demands of Western culture and advancement have taken root even in Maejantai. Villagers must pay for their children to attend a nearby school and conveniences like cell phones have necessitated a move toward a more monetary based system in the villages. Akha Ama’s goal is to give these villagers control over what they produce and funnel the money back into the community. That is the practical and political side to Akha Ama, but it’s only part of why I brought Ana on the Coffee Journey. Throughout the three days, Lee took us through each stage of the coffee process—from picking the beans out in the fields all day, to drying them, husking, processing, bagging, storing, and transporting them. Then, once Lee is back in Chiang Mai, he roasts the beans, packages, and sells them through Akha Ama, as well as a handful of other coffee shops in Thailand. The fields we walked to from Lee’s village, it’s about a 45 minute walk at a slow pace and on the last turn the path opens up to this beautiful valley filled with coffee and tea plants. 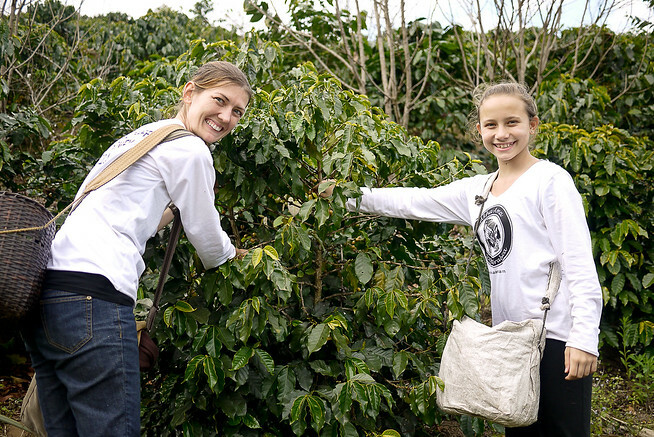 On the second day of our Coffee Journey, Ana and I walked for 45 minutes to Lee’s family’s coffee fields, where he explained how they grow and harvest the plants. Then, he handed us each baskets and instructed us on how to properly twist and pluck the ripe coffee cherries. 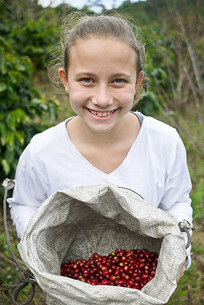 Ana gamely joined in on the picking with enthusiasm for the first couple of hours as our basket slowly filling with shining red and yellow ripe cherries. 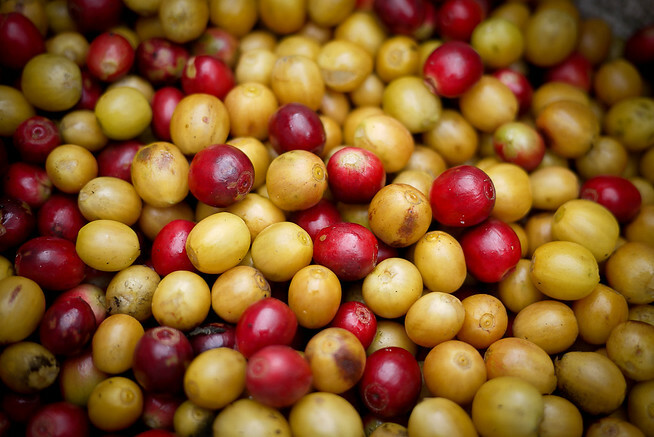 A basket full of perfectly ripe red and yellow coffee cherries we spent the day picking. And as the time passed, the “fun” gave way to understanding. We spent a couple hours in the fields before being called to lunch. We ate a plentiful lunch on huge banana leaves. And then we headed back into the coffee fields for round two. We picked more cherries. And as some baskets began to fill, Lee and other villagers eagerly replaced our baskets and encouraged us to continue picking. After several hours, my hands and arms were cramping, and I could see Ana respectfully continuing to pick since Lee had asked us to continue, but the game aspect of this all was gone. It wasn’t miserable mind you, far from it, the weather was a perfect mix of cool breeze and warm, beautiful sunshine, but the reality of the task, of picking for your survival and livelihood sunk in for our rag-tag group of 20 or so participants. As we picked, Lee’s family spent the day picking vegetables and preparing dinner for our group—it’s no easy task to prepare food for 20 hungry people. A delicious sampling of the dishes served for dinner on the coffee journey. And as it happened, on this second coffee journey, at the end of our long day in the fields, Ana and I joined a large bonfire under a sky filled with more stars than Ana had ever seen in her life and welcomed in the New Year with new friends, new realizations, and perspective shifts on what it takes to live and enjoy life. The next day, the realities of processing coffee continued as we watched Lee’s sister sort through the coffee beans (picking out the under-ripe cherries our group unknowingly picked), then a machined husked the beans, sort the beans from the husks, and the families then took these wet coffee beans to huge tarp-covered pallets so the beans could then dry out in the cool mountain air. Coffee beans drying in the cool mountain air. Dry beans are then bagged and stored until they are ready for the journey to Chiang Mai, where Lee roasts the beans, bags them, sells them, and grinds them for coffee. Lee’s village is beautiful, the people and smiles were open and welcoming from the moment our feet hit that compact, dusty red earth. The welcome was genuine and each villager we met was willing to open up to a group of strangers in the hopes that we would learn and take away an understanding of all that lies behind the Akha Ama brand. The densely packed red earth in Maejantai village and the warm fire that ran throughout the cold morning and evening hours. There are people behind that logo. 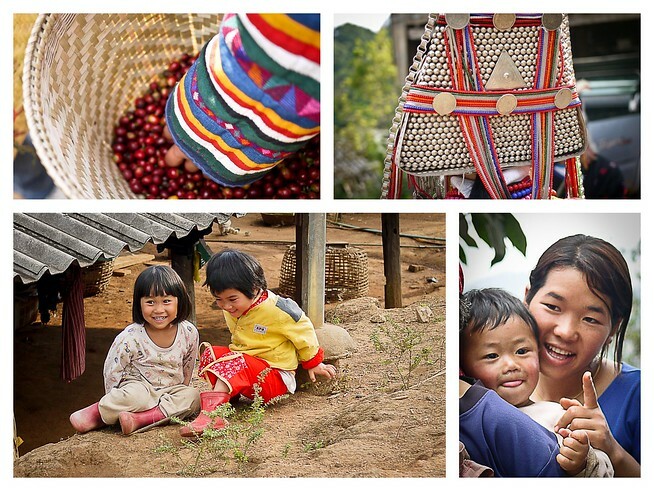 A community of children, mothers, and fathers exist behind each package of coffee Lee sells in his shop. And with each sale, the money is a tangible investment in a remote community living on a faraway hill-side. Ana watched the young children in Maejantai play games around her, using their imagination for epic, staged battles between good and evil that echoed the games her little brother regularly plays back home. I didn’t have to point out the similarities for everyone to see they exist, to see our common humanity. Jenny, Lee’s assistant holding Lee’s young nephew. On my first visit he was the youngest in the village, but by the time I returned he had a newborn sister! For Lee, his journey continues past our single Coffee Journey. As the front end of Akha Ama, Lee is actively working to promote the brand as a sustainable, fair trade, organic coffee brand. And only through talking with Lee did I realize the lengthy and expensive process that goes into legally using many of these words. As the face of this collective, Lee has embarked on a process that could secure the future of his village. There are few opportunities beyond farming for such a remote community, and the lure of modernization takes much of the youth out of the village and into the big cities. But with money, with an operation and something to back and believe in, Akha Ama is changing opportunities for each family of the 14 families in Maejantai. Over the years, news stories have challenged the idea of fair trade as flawed and unable to substantiate on a large-scale. Victoria’s Secret had a fair trade scandal in late 2011 when one of their suppliers of certified fair trade cotton in Burkina Faso used child labor to pick and plant, contravening established fair trade rules. And so, it’s easy to look at that and give up on the entire notion. But through meeting Lee, I was able to put a face and an experience to the entire process. 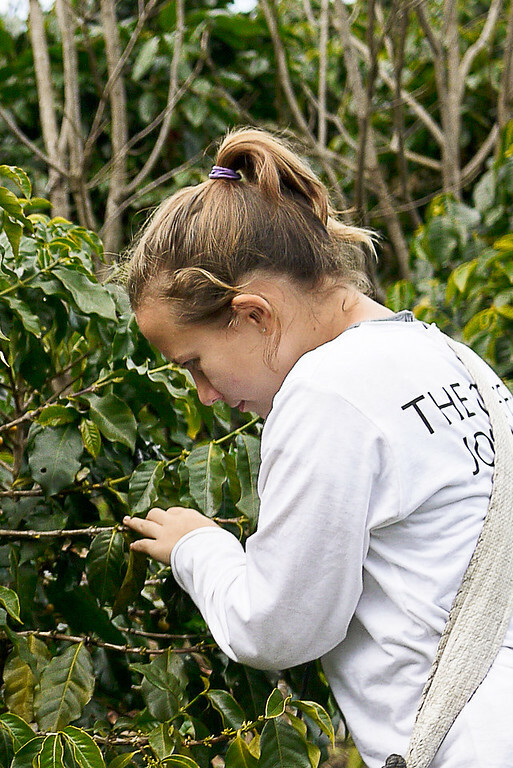 At its most basic, fair trade means that the people at the beginning of the process—the community growing your coffee/chocolate/cotton—have a shot at fair profits and fair opportunities. Without this equality, the harsh reality is that communities in the developing world are too-often forced to sell their goods for whatever someone will pay, even if that means selling below costs just for the sake of having some money in pocket. Baby shoes, drying coffee beans and handicrafts–a snapshot of daily life in the Akha village. There are flaws, to be sure, in the entire process because as consumers we are completely removed from the true back story, removed from the people and lives involved. 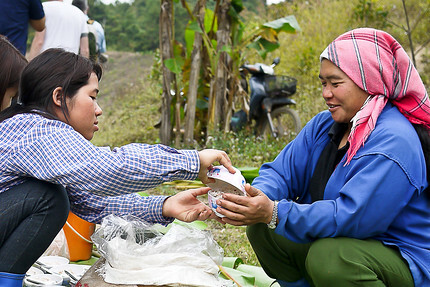 But Akha Ama’s story, with Lee as the charming face of this operation, is but on example of social enterprises and fair businesses operating around the world so communities can better themselves—create a future for their children. Deep among the Akha Ama coffee plants, Ana and I picked coffee cherries for hours and listened to Lee’s stories and explanations about life growing up in Maejantai. Further, Lee’s story opened my eyes to the human effect our purchasing habits have on the entire global community. By lifting the common consciousness, by seeking out the simple ways to support and give back in everyday life, we are able begin lifting up the global community. It is often just a small thing to tweak our buying habits. For me, coffee and chocolate are two habitual purchases I make … and with an awareness of what is out there, I now seek opportunities to support companies making an extra effort, spending more to ensure that the root communities behind our goods are treated with respect. 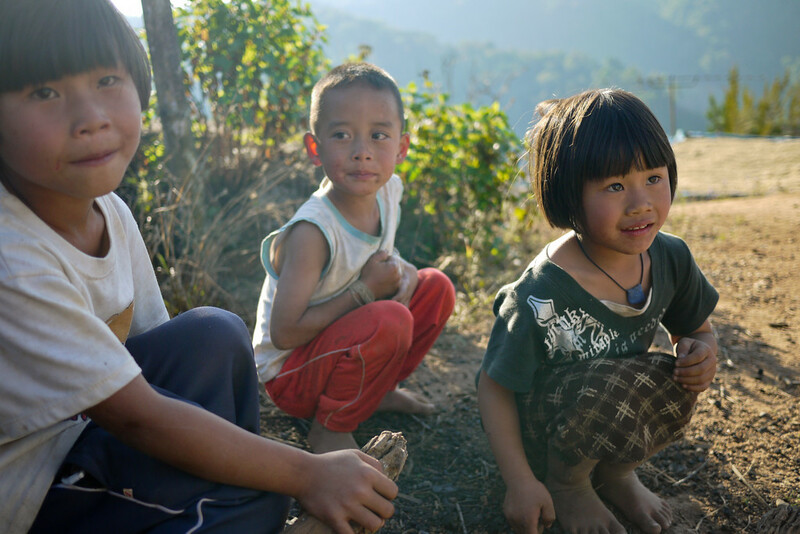 Maejantai village–the children and families working toward a lasting future for their community. To Lee, thank you. The Akha Ama Coffee Shop was my refuge in Chiang Mai and the community of expats and locals you have assembled in the coffee shop are a testament to the goodness and possibilities out there if you look for them. This post blends time and space and represents the sum of the two Coffee Journeys I took with Akha Ama; the photos from each journey are interspersed. For more of the trip, I took several hundred additional photos of the two coffee journeys. Where: 9/1 Mata Apartment, Hassadhisawee Rd, Soi 3 The coffee shop is just outside the moat in Chiang Mai, Thailand: directions.